So recently I took a full time job as a Visual Content Producer with a company out of San Francisco. That is basically fancy wording for I make videos and take photos for them. But the rad part is, I get to do adventure photography. Some of it is talking head video’s and studio shots. The other part of it is that I get to shoot lifestyle photos for our products. The other part of this is that I get to use my MS in Marketing for this job as well. When I finished my degree I spent time looking for a job that was a good fit. I held out I was broke, and it was hard. I met with some people and had phone calls with others. I even had one person tell me that I would never make it in the marketing world as I didn’t know how to code. (I had said in my resume and email that I am a creative with a mind for branding and communication, never mentioned coding). Well, I finally landed this job, and it is a perfect fit, I am still going to shoot weddings but I am going to focus on a different realm of weddings. But the rad part about this job is I get to go to rad places and meet rad people and shoot rad photos. I am writing this to recount the adventure that just happened. So we are a two-man marketing team, we pitched this idea for a shoot for our upcoming spring/summer products and get out into the field to test as well as to get epic photos with each product. We planned to shoot in Southern Utah area as we had water, and epic scenes that fit with the story that we want to tell. Day 1. Really the shoot started in the airport. We knew that as with most adventures, the travel is part of the story, so we spent some time getting some photos with the products we wanted to highlight as we waited for the plane to head out. We arrived in Las Vegas at about 11:30pm and had just enough time to pick up the rental car and to get to In-n-Out. Which is epic. Living in Colorado we keep waiting for In-n-Out to make its way to us. So even though this was only a couple hours, it was still day one. Day 2. We woke up in Las Vegas, and after a hasty breakfast of waffles, yogurt, and an apple we headed to Hurricane, Utah. The big unknown of our shoot was some underwater photography. I have never shot underwater, or done free diving, so this was going to be exciting, but the wind was blowing really hard and the water was about 50 degrees. After a quick weather check we decided that the next day would be better so we headed to another location. We spent a good portion of our day in Snow Canyon State Park, which was gorgeous, but insanely windy. Day3. We knew that the weather would be great in the afternoon so in the morning we took off to go check out Kanarraville Falls. It was 50 degrees when we left our hotel, but as we drove we watched the temperature gauge in the car continue to drop. When we arrived at the trailhead it was 32 degrees and there was snow on the ground, and we were wearing shorts. But after the 2.5 mile hike, which part of it is through the stream, which was basically freshly melted snow, we arrived at one of the most epic locations I have ever seen. After hiking down and bringing life back to our feet, we headed to Sand Hollow to attempt the diving photos. The one thing that we did not take into account when planning this adventure was how cold the water would feel and how hard it is to hold your breath when your lungs seize due to the cold. So shooting underwater, without wetsuits, was extremely difficult. But we got some rad shots. 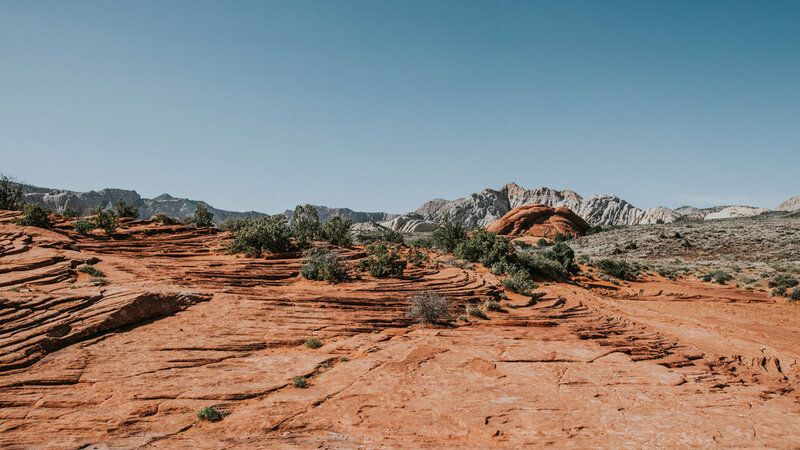 On the back to Las Vegas to catch our flight, we made one last stop to get some shots and footage in The Valley of Fire. The slot canyons here were insane. You could see where over the centuries the water had shaped and moulded the landscape. Even with the flight home being delayed by 4 hours and arriving home at 2am, the adventure was a success, we created epic content, and had a blast.